შხვა შანულობეფშო ქოძირით ვაშინგტონი (მიარეშანულამი). ჯორჯ ვაშინგტონი (ინგლ. George Washington; დ. 22 ფურთუთა 1732, ვესმორლენდ ქაუნთი, ააშ — ღ. 14 ქირსეთუთა 1799, მაუნტ-ვერნონი, ააშ) — ამერიკაშ აკოართაფილი შტატეფიშ მაართა პრეზიდენტი 1789-1797 წანეფს. 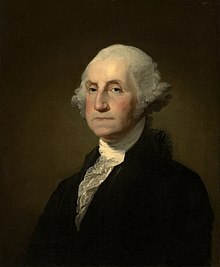 What Made George Washington a Good Military Leader?. EDSITEment: Lesson Plans. National Endowment for the Humanities. თე ხასჷლაქ ეკონიას გეახალუ 17:16-ს, 20 ღურთუთა 2017-ის.